Taking wide field images of the heavens is now quite an important part of astrophotography with photographers travelling to dark sky sites with minimal equipment to capture what can be stunning images of the constellations and the Milky Way. Using small cameras and short focal length lenses, the equipment required can be quite light so one could easily travel off the beaten track, but systems are also available to mount DSLR cameras and lenses up to 500 mm in focal length. This article will look at the three star trackers that I have acquired over the years after covering some general points about tracking mounts. In star trackers the system to track at sidereal rate usually employs a worm drive on a circular gear ring to rotate the mount head at sidereal rate. (However, two of mine don’t!) The camera will then track the stars and so ‘star trailing’ will not be present in the resulting images. The more accurately the mount tracks the longer the exposures that can be made and/or the longer the focal length of the lens that can be employed. Two factors will determine the tracking accuracy; the diameter of the effective gear, the precision to which is has been made together with the precision of the worm that drives it. As an example, I could acquire a higher precision worm gear for my Losmandy GM8 equatorial mount to halve its tracking error. Larger diameter and higher precision gears and worms will, in principle, give better tracking performance. I assume that with crystal controlled oscillators used to control the sidereal drive rate this will not affect the tracking precision. However good the potential tracking performance of a mount, it will not be realized unless the mount is accurately aligned on the North (or South) Celestial Pole. The accuracy required is determined by a combination of the focal length of the lens and the length of the exposures so that, say, a 30 second exposures with a 24 mm focal length lens will require far less precision than a 3 minute exposure and a 200 mm focal length lens. However, I really believe that it is better to have a slightly misaligned mount and use shorter exposures than have a perfectly aligned mount. Why? Tony Hallas has called the problem ‘Colour Mottling’. 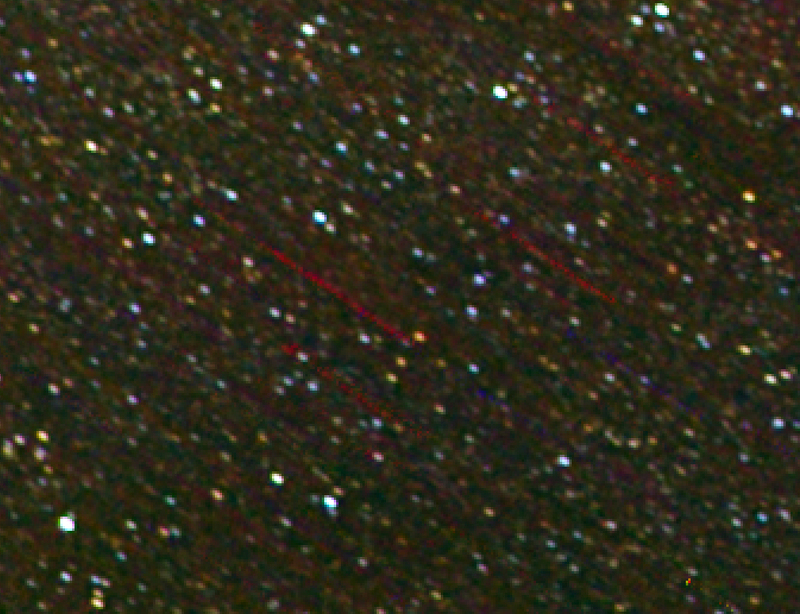 The sensitivity of the pixels under their red, green and blue filters is not uniform across the camera sensor and if the sensor is not moving with respect to the star field because the tracking is perfect, then the low level background noise will show ‘blotches’ of colour as seen in the image below. 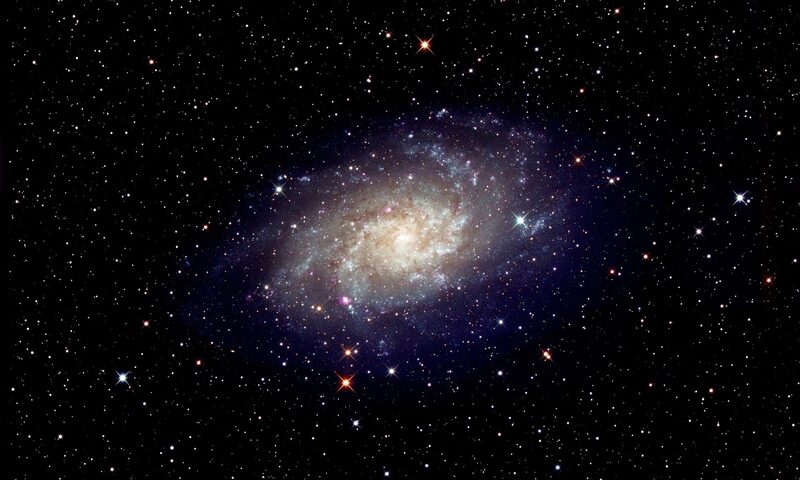 Tony Hallas suggests moving the sensor relative to the stars by a small amount over a set of short exposures. If the polar alignment is not perfect then this is exactly what will happen over a series of perhaps 20-40 frames taken of the star field. The free program ‘Deep Sky Stacker’ will align all the frames before stacking them to give the result (not quite) of one long exposure. Hopefully, the colour mottling will then average out giving a grey background. A downside is that not all the resultant image will have used every frame in the sequence and so a little cropping will be required. If one has been using, say, a 4,000 pixel sensor, a drift of perhaps 50 pixels over the observing period to remove colour mottling will have almost no effect! A further small advantage is that dust moats on the sensor will become less apparent. One problem that may then ensue is that ‘walking noise’ may become apparent. 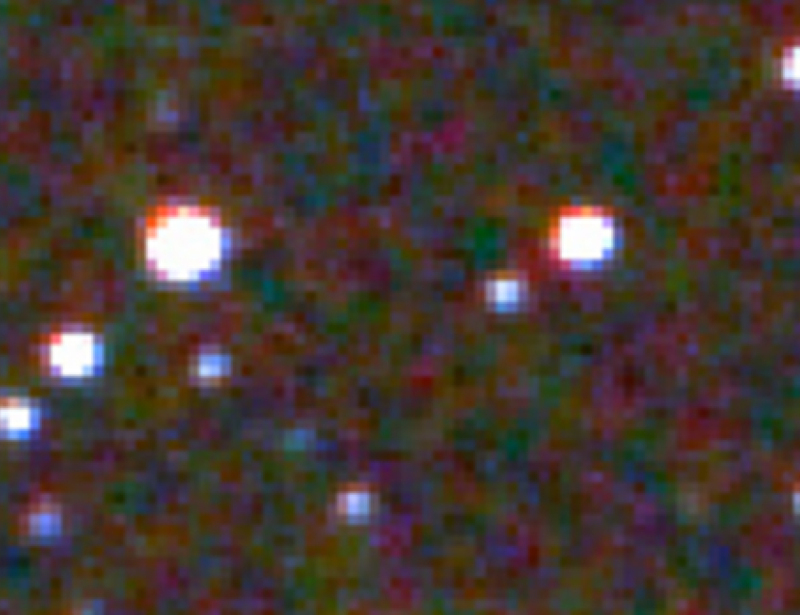 Warm pixels, usually red, will appear to march linearly across the image, a little dot for each light frame in the image as seen in the picture below. The eye picks out linear features rather well! A way to help mitigate this problem and also cure colour mottling is to slightly offset the polar alignment randomly during the taking of the exposures − a process called ‘dithering’. With the Manfrotto Junior Gear Head on which I now mount my Astrotrak, this is easily achieved by making very small adjustment to the fine control knobs for azimuth and elevation. Using Astronomy Photography Tools to control my modified Canon D1100 camera it is easy to pause the taking of ‘light’ frames whilst the head is moved and allowed to settle. Perhaps make fine adjustments every 5 or so ‘light’ frame exposures. The only technique that will eliminate the ‘walking noise’ completely is to use ‘dark frames’ which will ‘map’ the warm pixels and remove them from the aligned and stacked image. The taking of dark frames when using a DSLR is quite tricky and I have posted an in depth review of this subject, ‘The use of Dark Frames when using a DSLR’, in the digest which I hope will be of interest. 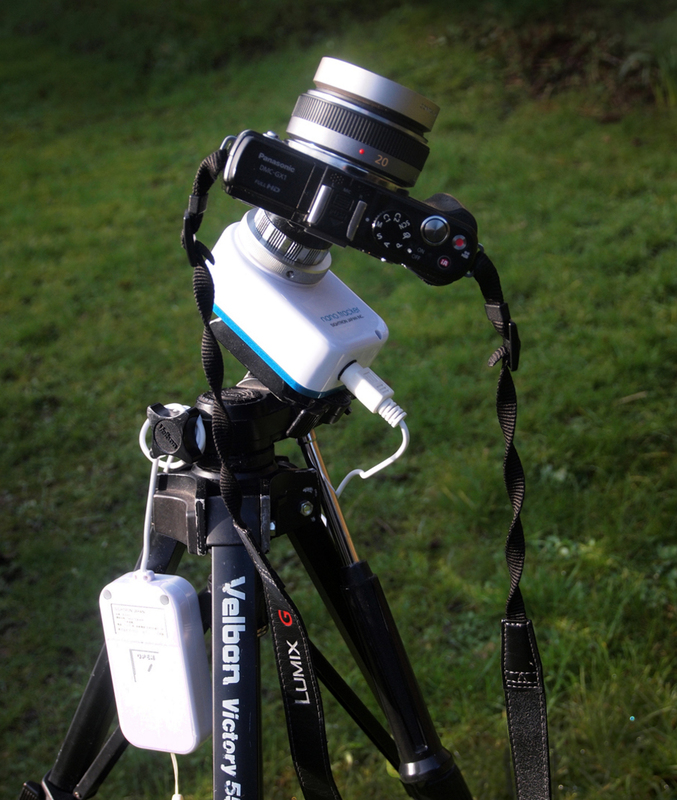 It includes quite a novel approach using a hair dryer so that the camera sensor can reach a stable temperature quickly. So, do not perfectly align the tracking mount or perhaps use ‘dithering’ and then take shorter exposures to avoid star trails. This innovative tracking mount is produced by the UK company, AstroTrac, and called the TT320X-AG. The ‘AG indicates that it is equipped with a ST4 auto-guiding port to allow guiding in Right Ascension though I suspect that this facility will not often be used. Once polar aligned, it can track accurately for nearly 2 hours. However, even without guiding it is capable of making exposures of up to 5 minutes with a typical tracking error of +/- 5 arc seconds (assuming accurate polar alignment). This accuracy is due to the fact that the drive, resulting from the rotation of a precision screw under the control of a small computer is at the base of a long arm which is ~35 cm long, so the effective gear diameter is ~70 cm! The screw assembly (effectively the worm) is precision manufactured in the US to AstroTrac’s rigorous specification and is an integral part of the motor. To track accurately, the rate at which the screw rotates must vary as the arm is extended and this is controlled by two microprocessors running at 16 and 20 million instructions per second. The angular motion of the mounting head is far less than the motion of the screw and the result is that any periodic error in the screw thread drive is greatly reduced. To achieve equivalent tracking accuracy a very expensive equatorial mount would be required. Though the mount weighs just 1 kg (2.2 pounds), given a suitably solid tripod or pillar, it can support up to 15 kg (33 pounds) so even 80mm refractors or a Celestron C6 Schmidt-Cassegarain could be used. AstroTrac provide a TH3010 counter-balanced head to allow such telescopes to be mounted on it. 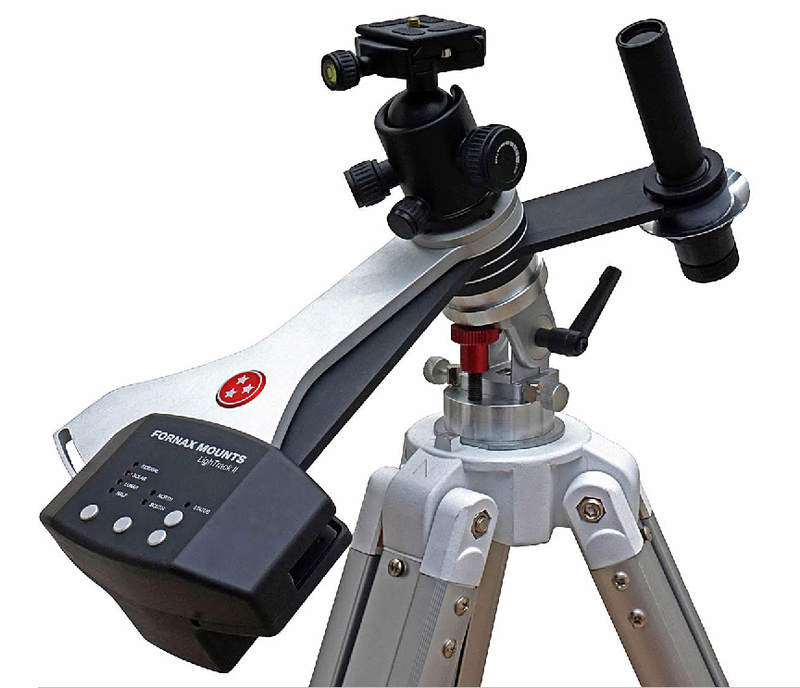 A sturdy tripod is required with a pan and tilt or geared head (using the tripod manufacturer’s accessories) or an equatorial wedge to mount the AstroTrac so that it can be polar aligned. An extendible bracket is provided in which the illuminated polar mount (or alternative alignment system as described below) is mounted as seen in the figure below. A sturdy ball and socket head is required to hold the camera. They also provide a very neat and compact equatorial wedge and an ultra light pier which, for transporting by car or air, can contain and protect the AstroTrac itself. I mount my AstroTrak on a Manfrotto 190XPROB professional tripod, initially using a solid pan and tilt head but, more recently, the Manfrotto 410 Junior Geared Head which is being used by quite a number of AstroTrak users. This makes it very easy to finely adjust both azimuth and elevation and there is even a ‘dial’ to help set the approximate elevation by setting it to 90 – latitude. However, the configuration of the geared head does mean that the weight of the mount and camera is offset to one side of the tripods vertical axis and so I align the mount along one of the legs which are well splayed for stability. This is fine for cameras and reasonable sized lenses but not, I suspect for use with a telescope and counterweight when a pan and tilt head or AstroTrak’s own equatorial wedge will be needed. 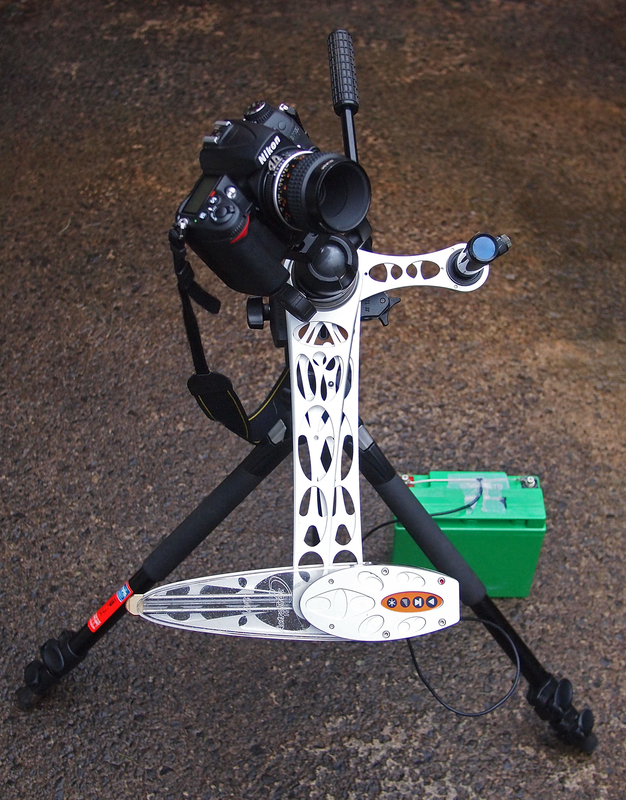 As an alternative to AstroTrak’s wedge, Skywatcher provide an equatorial wedge that some AstroTrak users are employing. A recent addition to the range of star trackers is the StarSync tracker which (in a way I rather like) puts ‘function-over-form’. It is a stainless steel and aluminium development of the simple ‘Barn Door’ tracking mount that many astrophotographers constructed and used before the current sophisticated star trackers were available. As seen in the figure below, the upper plate is driven by a stepper motor rotating a solid metal screw. To compensate for the fact that the screw is straight, not curved, the screw needs to turn at a variable rate which is controlled by a small microcomputer. It can track for over 2 hours before it resets automatically. [My early version did not, in fact, do this and, very pleasingly, I was able to suggest a very simple software addition to the computer’s code to achieve this.] The camera mounting head is built in, so a ball and socket joint is not required and there is a channel in which to lay a laser pointer with which to align onto the North Celestial Pole. Sadly, at the time of writing, it is only available in the USA. The StarSync has a greater effective gear radius (19 cm) than the gears used in the compact star trackers and so should allow for more accurate tracking giving the ability to take longer exposures. This is a very solidly made mount and thus could be easily used with longer focal length lenses than the smaller tracking mounts. I particularly like the tall camera mounting head which allowed the camera to be aligned on the sky somewhat more easily that when using a ball and socket joint. I took it to the Kerry dark sky reserve in Ireland to image the Milky Way and the results are discussed in detail in the digest article − ‘Imaging the Milky Way from the Kerry Dark Sky Reserve’. 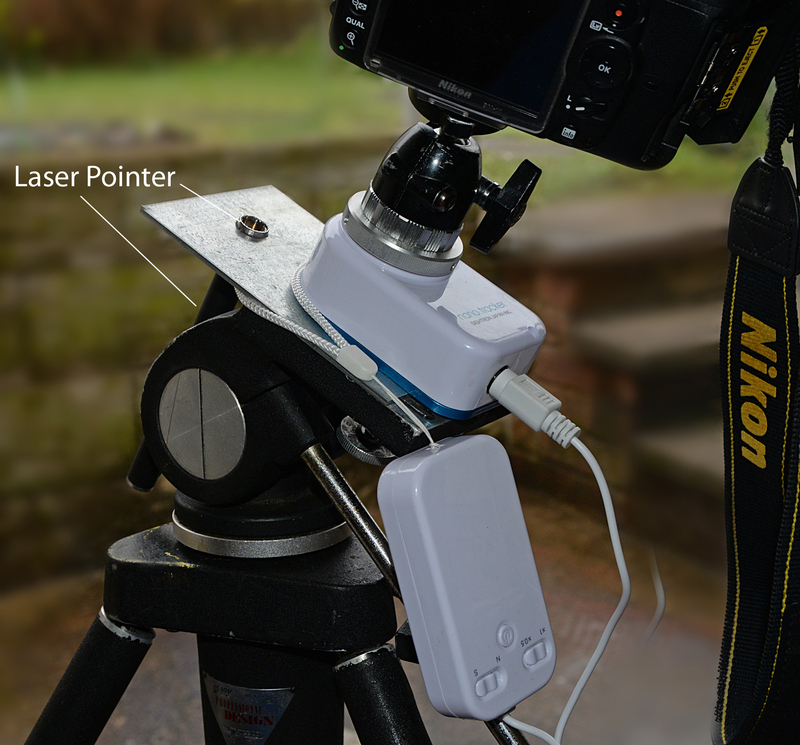 Again, there can sometimes be a problem with the use of a laser pointer to align the mount, and so perhaps one could make a fitment so that the QHY PoleMaster could be used instead. The smallest and lightest tracking mount (but still weighing 360 grams) is the Baader Planetarium (or Sightron) Nano Tracker which is also the least expensive at around £200. It is supplied with a small battery/control unit. With a Right Ascension gear of just ~2-inches diameter it will have a somewhat lower tracking accuracy than those described above. One weakness is that only a small, and not very practical, sight hole is provided for polar alignment. 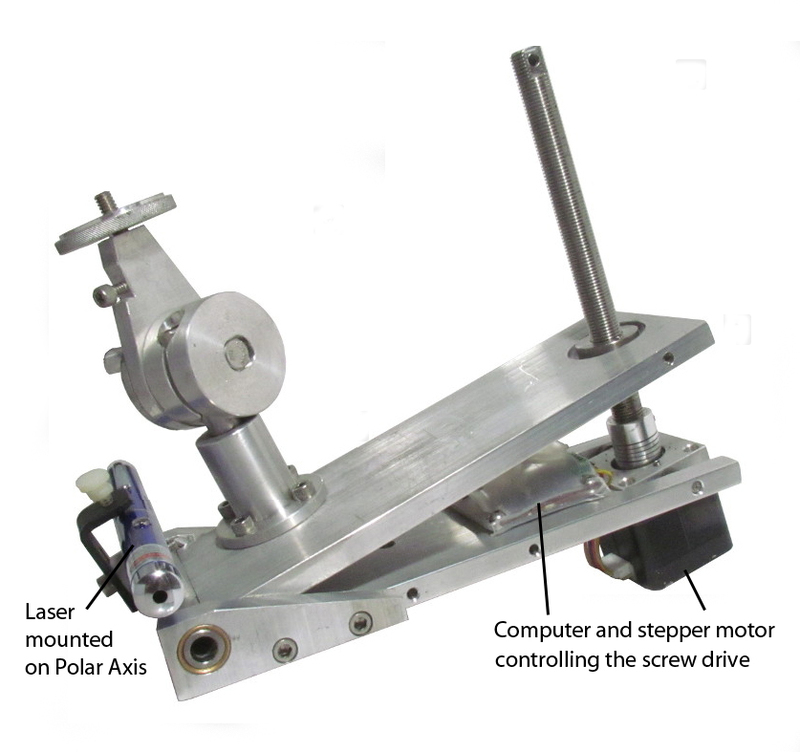 I have acquired one for use when travelling by air with a very limited luggage allowance and have made a simple aluminium plate on which I can mount a laser pointer for polar alignment as seen in the figure below. The laser beam must be offset from the Pole Star by 0.7 degrees (43 arc minutes to be precise and about the width of a little finger at arm’s length) towards the star Kochab in Ursa Minor. This would not have been much use in the southern hemisphere and so I simply used a compass and protractor to determine the required azimuth and elevation. Happily, the region of the Milky Way that I was imaging was not that far from the South Celestial Pole. The result of this imaging exercise is described in detail in the article ‘A Beautiful Southern Hemisphere Skyscape’ in this digest.